Born to Spanish immigrants to the New World. A beautiful girl and devoted daughter, she was so devoted to her vow of chastity that she used pepper and lye to ruin her complexion so she would not be attractive. Lived and meditated in a garden, raising vegetables and making embroidered items to sell to support her family and help the other poor. Dominican tertiary in 1606. Mystic. Visonary. Received invisible stigmata. Suffered from assorted physical and mental ailments. First saint born in the Americas. Founder of social work in Peru. 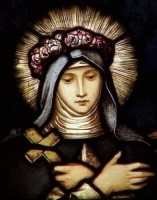 Great devotion to Saint Catherine of Siena. As a boy he was captured and enslaved by pirates, first to Britain, then to Brittany. Friend of Saint Tighernach. As an adult he escaped from the pirates, returned to Ireland, and became a monk. Abbot of Kilnamanagh Abbey, County Wicklow for 15 years. Retired to live as a hermit in the the Mourne valley, County Tyrone c.576; his piety attrached many would-be students. Spiritual teacher of Saint Kevin of Glendalough. First bishop of Ardstraw, Ireland c.581. He was considered its patron from the beginning; the see was moved to Derry in 1254, and Eoghan continued as a patron. Franciscan Capuchin priest. Imprisoned on a ship in the harbor of Rochefort, France and left to die during the anti-Catholic persecutions of the French Revolution. One of the Martyrs of the Hulks of Rochefort. Basilian monk at the Greek monastery of San Felipe Argiró near Locri in lower Calabria, Italy. Friend of Saint Nicodemus of Mammola and Saint Jeiunio of Gerace. Known for his ascetic physical and deep prayer life, and as a miracle worker. Priest in the archdiocese of Gniezno, Poland. Tortured and martyred in the Nazi persecutions. Born a princess, the daughter of Saint Brychan of Brecknock in Wales. Killed by pagan Saxons. Sixth century bishop in North Africa near modern Tunis, Tunisia. Exiled to Sardinia by Arian heretics. His writings on the persecutions by the Arian Vandals has survived. Jailer in Rheims, France. A spectator at the martyrdom of Saint Timothy, Apollinaris was so moved by the Timothy's courage and faith that he converted. Martyr. Seventh-century bishop of Autun, France. Pious Christian woman martyred in the persecutions of Pro-consul Lysias. Deacon. One of a group martyred in the persecutions of Alexander Severus. Bishop. One of a group martyred in the persecutions of Alexander Severus. Priest. One of a group martyred in the persecutions of Alexander Severus. Benedictine monk martyred by Saracens. Christian slave. Martyr, date and location unknown. A group of Christian brothers, Asterius, Claudius and Neon, denounced by their step-mother who were then tortured and martyred in the persecutions of Pro-consul Lysias.